The Lost Sanjak is an intriguing story about how a man came to be condemned for murdering himself. His defense? "I am a victim to a lack of specialisation in my education and character.". 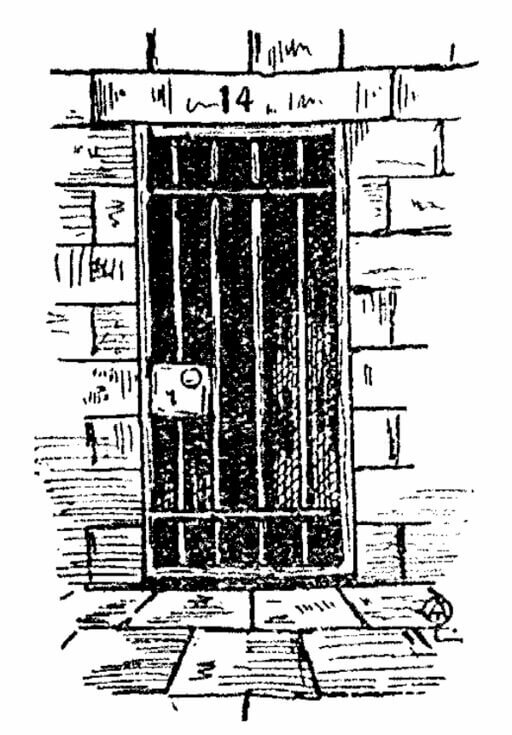 The prison Chaplain entered the condemned's cell for the last time, to give such consolation as he might. "The only consolation I crave for," said the condemned, "is to tell my story in its entirety to some one who will at least give it a respectful hearing." "We must not be too long over it," said the Chaplain, looking at his watch. "Most people will be of opinion that I am paying the penalty of my own violent deeds. In reality I am a victim to a lack of specialisation in my education and character." "Lack of specialisation!" said the Chaplain. "Yes. If I had been known as one of the few men in England familiar with the fauna of the Outer Hebrides, or able to repeat stanzas of Camoens' poetry in the original, I should have had no difficulty in proving my identity in the crisis when my identity became a matter of life and death for me. But my education was merely a moderately good one, and my temperament was of the general order that avoids specialisation. I know a little in a general way about gardening and history and old masters, but I could never tell you off-hand whether 'Stella van der Loopen' was a chrysanthemum or a heroine of the American War of Independence, or something by Romney in the Louvre." "I fell in love, or thought I did, with the local doctor's wife," continued the condemned. "Why I should have done so, I cannot say, for I do not remember that she possessed any particular attractions of mind or body. On looking back at past events if seems to me that she must have been distinctly ordinary, but I suppose the doctor had fallen in love with her once, and what man had done man can do. She appeared to be pleased with the attentions which I paid her, and to that extent I suppose I might say she encouraged me, but I think she was honestly unaware that I meant anything more than a little neighbourly interest. When one is face to face with Death one wishes to be just." The Chaplain murmured approval. "At any rate, she was genuinely horrified when I took advantage of the doctor's absence one evening to declare what I believed to be my passion. She begged me to pass out of her life, and I could scarcely do otherwise than agree, though I hadn't the dimmest idea of how it was to be done. In novels and plays I knew it was a regular occurrence, and if you mistook a lady's sentiments or intentions you went off to India and did things on the frontier as a matter of course. As I stumbled along the doctor's carriagedrive I had no very clear idea as to what my line of action was to be, but I had a vague feeling that I must look at the Times Atlas before going to bed. Then, on the dark and lonely highway, I came suddenly on a dead body." The Chaplain's interest in the story visibly quickened. "Judging by the clothes it wore, the corpse was that of a Salvation Army captain. Some shocking accident seemed to have struck him down, and the head was crushed and battered out of all human semblance. Probably, I thought, a motor-car fatality; and then, with a sudden overmastering insistence, came another thought, that here was a remarkable opportunity for losing my identity and passing out of the life of the doctor's wife for ever. No tiresome and risky voyage to distant lands, but a mere exchange of clothes and identity with the unknown victim of an unwitnessed accident. With considerable difficulty I undressed the corpse, and clothed it anew in my own garments. Any one who has valeted a dead Salvation Army captain in an uncertain light will appreciate the difficulty. With the idea, presumably, of inducing the doctor's wife to leave her husband's roof-tree for some habitation which would be run at my expense, I had crammed my pockets with a store of banknotes, which represented a good deal of my immediate worldly wealth. When, therefore, I stole away into the world in the guise of a nameless Salvationist, I was not without resources which would easily support so humble a role for a considerable period. I tramped to a neighbouring market-town, and, late as the hour was, the production of a few shillings procured me supper and a night's lodging in a cheap coffee-house. The next day I started forth on an aimless course of wandering from one small town to another. I was already somewhat disgusted with the upshot of my sudden freak; in a few hours' time I was considerably more so. In the contents-bill of a local news sheet I read the announcement of my own murder at the hands of some person unknown; on buying a copy of the paper for a detailed account of the tragedy, which at first had aroused in me a certain grim amusement, I found that the deed ascribed to a wandering Salvationist of doubtful antecedents, who had been seen lurking in the roadway near the scene of the crime. I was no longer amused. The matter promised to be embarrassing. What I had mistaken for a motor accident was evidently a case of savage assault and murder, and, until the real culprit was found, I should have much difficulty in explaining my intrusion into the affair. Of course I could establish my own identity; but how, without disagreeably involving the doctor's wife, could I give any adequate reason for changing clothes with the murdered man? While my brain worked feverishly at this problem, I subconsciously obeyed a secondary instinct--to get as far away as possible from the scene of the crime, and to get rid at all costs of my incriminating uniform. There I found a difficulty. I tried two or three obscure clothes shops, but my entrance invariably aroused an attitude of hostile suspicion in the proprietors, and on one excuse or another they avoided serving me with the now ardently desired change of clothing. The uniform that I had so thoughtlessly donned seemed as difficult to get out of as the fatal shirt of--You know, I forget the creature's name." "Yes, yes," said the Chaplain hurriedly. "Go on with your story." "Somehow, until I could get out of those compromising garments, I felt it would not be safe to surrender myself to the police. The thing that puzzled me was why no attempt was made to arrest me, since there was no question as to the suspicion which followed me, like an inseparable shadow, wherever I went. Stares, nudgings, whisperings, and even loud-spoken remarks of 'that's 'im' greeted my every appearance, and the meanest and most deserted eating-house that I patronised soon became filled with a crowd of furtively watching customers. I began to sympathise with the feeling of Royal personages trying to do a little private shopping under the unsparing scrutiny of an irrepressible public. And still, with all this inarticulate shadowing, which weighed on my nerves almost worse than open hostility would have done, no attempt was made to interfere with my liberty. Later on I discovered the reason. At the time of the murder on the lonely highway a series of important bloodhound trials had been taking place in the near neighbourhood, and some dozen and a half couples of trained animals had been put on the track of the supposed murderer--on my track. One of our most public-spirited London dailies had offered a princely prize to the owner of the pair that should first track me down, and betting on the chances of the respective competitors became rife throughout the land. The dogs ranged far and wide over about thirteen counties, and though my own movements had become by this time perfectly well- known to police and public alike, the sporting instincts of the nation stepped in to prevent my premature arrest. "Give the dogs a chance," was the prevailing sentiment, whenever some ambitious local constable wished to put an end to my drawn-out evasion of justice. My final capture by the winning pair was not a very dramatic episode, in fact, I'm not sure that they would have taken any notice of me if I hadn't spoken to them and patted them, but the event gave rise to an extraordinary amount of partisan excitement. The owner of the pair who were next nearest up at the finish was an American, and he lodged a protest on the ground that an otterhound had married into the family of the winning pair six generations ago, and that the prize had been offered to the first pair of bloodhounds to capture the murderer, and that a dog that had 1/64th part of otterhound blood in it couldn't technically be considered a bloodhound. I forget how the matter was ultimately settled, but it aroused a tremendous amount of acrimonious discussion on both sides of the Atlantic. My own contribution to the controversy consisted in pointing out that the whole dispute was beside the mark, as the actual murderer had not yet been captured; but I soon discovered that on this point there was not the least divergence of public or expert opinion. I had looked forward apprehensively to the proving of my identity and the establishment of my motives as a disagreeable necessity; I speedily found out that the most disagreeable part of the business was that it couldn't be done. When I saw in the glass the haggard and hunted expression which the experiences of the past few weeks had stamped on my erstwhile placid countenance, I could scarcely feel surprised that the few friends and relations I possessed refused to recognise me in my altered guise, and persisted in their obstinate but widely shared belief that it was I who had been done to death on the highway. To make matters worse, infinitely worse, an aunt of the really murdered man, an appalling female of an obviously low order of intelligence, identified me as her nephew, and gave the authorities a lurid account of my depraved youth and of her laudable but unavailing efforts to spank me into a better way. I believe it was even proposed to search me for fingerprints." "But," said the Chaplain, "surely your educational attainments--"
"That was just the crucial point," said the condemned; "that was where my lack of specialisation told so fatally against me. The dead Salvationist, whose identity I had so lightly and so disastrously adopted, had possessed a veneer of cheap modern education. It should have been easy to demonstrate that my learning was on altogether another plane to his, but in my nervousness I bungled miserably over test after test that was put to me. The little French I had ever known deserted me; I could not render a simple phrase about the gooseberry of the gardener into that language, because I had forgotten the French for gooseberry." The Chaplain again wriggled uneasily in his seat. "And then," resumed the condemned, "came the final discomfiture. In our village we had a modest little debating club, and I remembered having promised, chiefly, I suppose, to please and impress the doctor's wife, to give a sketchy kind of lecture on the Balkan Crisis. I had relied on being able to get up my facts from one or two standard works, and the back-numbers of certain periodicals. The prosecution had made a careful note of the circumstance that the man whom I claimed to be--and actually was--had posed locally as some sort of second-hand authority on Balkan affairs, and, in the midst of a string of questions on indifferent topics, the examining counsel asked me with a diabolical suddenness if I could tell the Court the whereabouts of Novibazar. I felt the question to be a crucial one; something told me that the answer was St. Petersburg or Baker Street. I hesitated, looked helplessly round at the sea of tensely expectant faces, pulled myself together, and chose Baker Street. And then I knew that everything was lost. The prosecution had no difficulty in demonstrating that an individual, even moderately versed in the affairs of the Near East, could never have so unceremoniously dislocated Novibazar from its accustomed corner of the map. It was an answer which the Salvation Army captain might conceivably have made--and I made it. The circumstantial evidence connecting the Salvationist with the crime was overwhelmingly convincing, and I had inextricably identified myself with the Salvationist. And thus it comes to pass that in ten minutes' time I shall be hanged by the neck until I am dead in expiation of the murder of myself, which murder never took place, and of which, in any case, I am innocent." When the Chaplain returned to his quarters some fifteen minutes later, the black flag was floating over the prison tower. Breakfast was waiting for him in the dining-room, but he first passed into his library, and, taking up the Times Atlas, consulted a map of the Balkan Peninsula. "A thing like that," he observed, closing the volume with a snap, "might happen to any one." Add The Lost Sanjak to your own personal library.